How Many Bags Does it Take? Q: I would like to design my home with 3D modeling software so my question is after a 18" X 30" EarthBag is filled and tamped, then placed in position, what would be the length, width and height of that bag? A: length: about 20" - 24", width: about 15" - 16" (with plaster), height: about 5" - 6"
We often get questions from people wondering how many bags they need to have on hand for some particular project. Is there a formula to figure this out? First you need to calculate the total square footage (or square meters) of the wall you intend to build. This can be done by simply multiplying the length times the height, and then to be precise, you can deduct the size of the windows and doors from this.but I usually don't do this because it is better to over-estimate how many bags you might need, and also, you always need some partial bags to keep the brick pattern going. If your wall is curved you'll need to figure out the running length of the wall by either making a scale drawing and measuring the length that way, or in the case of a circle you can use the formula Length = 3.14 X the diameter for this. Figuring out the surface area of a dome is obviously more complicated, partly because there are many shapes for domes. If the dome is close to hemispherical (not recommended for structural reasons) the formula would be 3.14 X the diameter squared. If the dome more closely resembles a cone, then the formula would be 3.14 X the radius X the radius plus the length from the circle at the base to the top of the cone. Either of these formulas could be used to estimate approximately what the area of your dome might be, especially, if that total is then padded by not deducting openings, or simply rounding upward. As far as bag coverage goes, it depends on the size of the bag how much square footage it will cover. I used what were labeled 50 lb. rice bags to build my house. These measured roughly 5" X 20" when laid in a wall and compacted. That is approximately .7 of a sq. ft. A nominal 100 lb. bag might actually be considerably larger than what I used, so you'll need to run some tests to determine what kind of coverage to expect. The 50 lb. bags I used measured about 18" X 30" when laid flat. Once you have figured out what the area of one bag might be after it is filled and tamped, then you can divide that figure into your total wall space to get the total number of bags needed. For instance, with the 50 lb. bags that I used, you would divide the area by .7 to get the total number of bags needed. In this case, for example, a 100 square foot wall would require roughly 143 bags. Q: How big will 1000 bags do? A: I used the 50 lb. rice bags, and each one will cover about two thirds of a square foot of wall area, so you might expect to be able to create roughly 700 square feet of wall area. Q: Just wondering about an estimation of how many sand bags there would be needed to construct a 3m x 6m cabin with a height of 3m? A: You can expect to cover about 0.075 sm/bag, so 54 sm would take 720 bags. You often need partial bags, and sometimes they get tamped thinner, so you might figure on more like 800 for the job. Q: Do you have, or know of, a formula for calculating the yardage/tonnage requirements for earthbags? For example, if we were going to use 4000 14 x 26 bags (mostly folded over, only stapled at the doorway, like you do) of scoria, how would we calculate how much scoria to order? We have to allow for tamping, too. A: The only way I know to calculate volume of fill material for earthbag structures is to actually figure it out mathematically, by multiplying surface area by the depth of the wall. There is a formula for the surface of a cone that you can use for you tipi shape. I figured a 20% compaction for the scoria from tamping and therefore added 25% to my calculations. Is that a good figure to use? Q: How do you ever figure out how many bags you need for a structure? I'd like to build a 14' cylindrical tower 18' high, with two upper floors, top one as a balcony. A: I used the 50 lb. rice bags, and each one will cover about two thirds of a square foot of wall area. Your cylinder tower will have about 800 sq. ft. of surface area, so you would need around 1200 bags. Q: How do you calculate how much earthbag tubing is needed in a roundhouse? A: (Owen Geiger) First, determine the exterior diameter of the roundhouse. Then we need to know the circumference of the roundhouse (Circumference of a circle: C=πD). Now we need to determine how many courses of bags there are. Most earthbags are about 5” high after tamping. 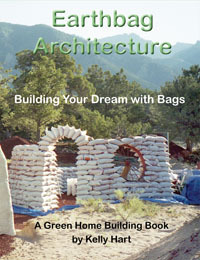 Many earthbag buildings have two courses of gravel bags below ground: Add 2 courses. Most earthbag buildings have a 6” high concrete bond beam: Deduct 1 course. You could deduct one course or so to compensate for windows and doors. Most earthbag builders prefer to have some extra tubing and so they don’t deduct for these openings. (It’s good to have extra. Maybe some of your courses are less than 5” or you make a mistake, etc.) So then you just multiply the number of courses by the circumference and you get the length of tubing needed.